My daughter Rachel, the gorgeous vegan who co-writes this blog with me, just flew home to Texas today after four fabulous and fun-filled days visiting us here in Colorado. 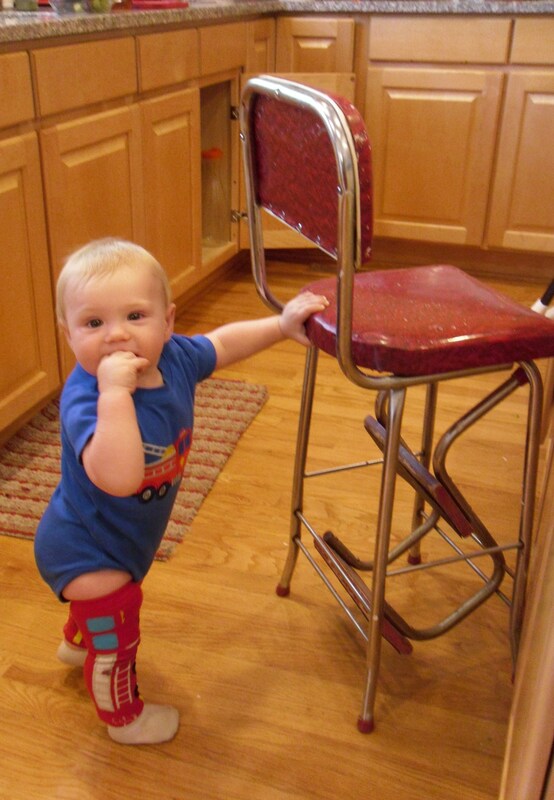 Because I only get to see my newest grandson every two to three months, I’m always shocked by how big he is. 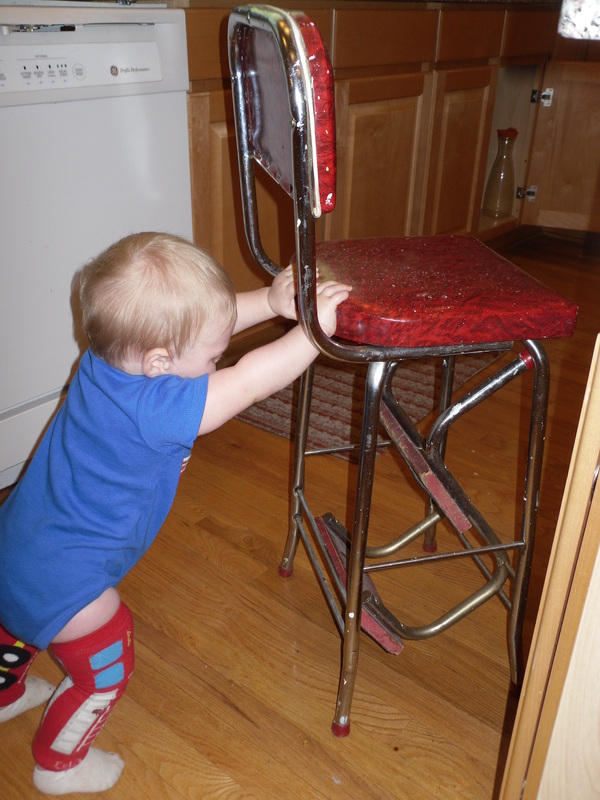 But in my wildest imagination, I did not expect 9 month old Jackson to hit the floor and immediately start moving my furniture around. Seriously, Rachel says he spends a portion of every day pushing and rearranging her furniture. Either he is a miniature Popeye-in-the-Making (he does love his spinach! ), or a budding interior decorator. 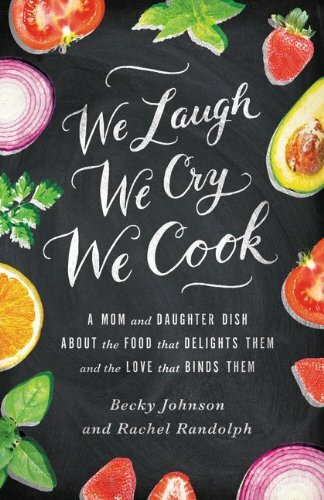 Whatever the case, Rachel and Jackson could be the poster mom & baby for an ad campaign for Eating Your Vegies. She is not only beautiful, but I marveled at her strength as well. 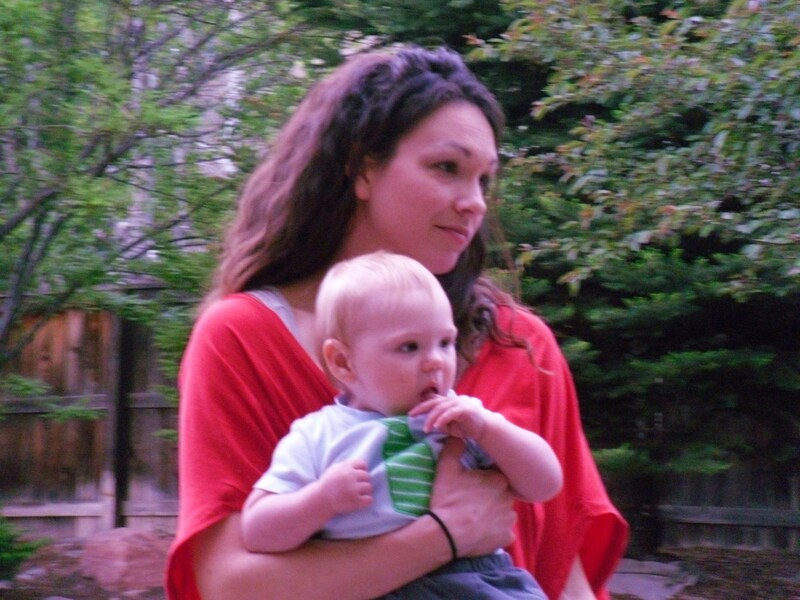 I was stunned with admiration as I watched her toss a diaper bag weighing as much as a baby elephant over one shoulder, while she balanced Jackson (no lightweight!) on the other hip, as if they were bags of popcorn. 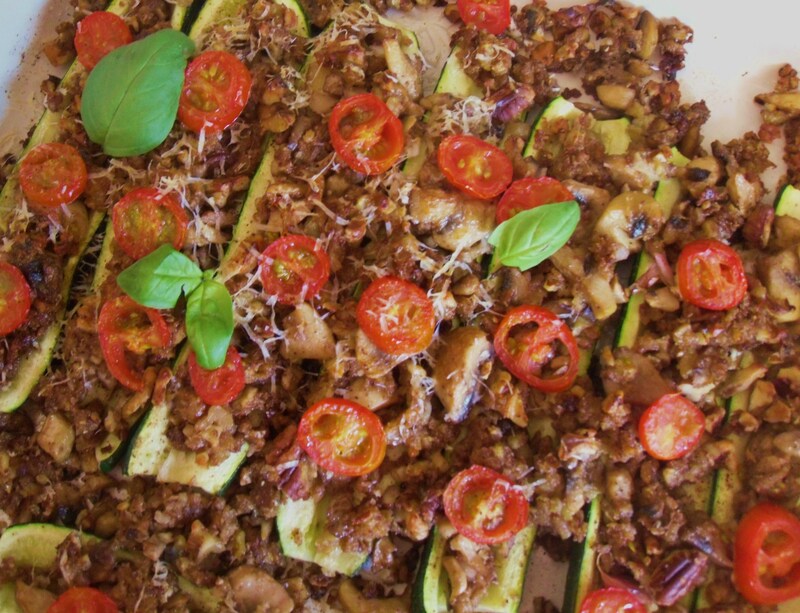 For their farewell vegan lunch today, I made one of my favorite vegie dishes, Mushroom-Pecan Stuffed Zucchini. I invented this recipe a couple of months ago, and it quickly became one of my favorite staple vegetable dishes. I’m really enjoying being an EOD (Every Other Day) vegetarian, feel my tummy is lighter and flatter and clothes a bit looser. This may be my favorite meatless meal. It’s a good comfort food while I’m missing the pitter-pat of my daughter’s feet and the scoot-scoot-scoot sound of my grandson moving the furniture across the wood floor. Put hollowed out zucchini “boats” in a heat-proof rectangle pan, lightly salt & pepper, and microwave for 6 minutes. 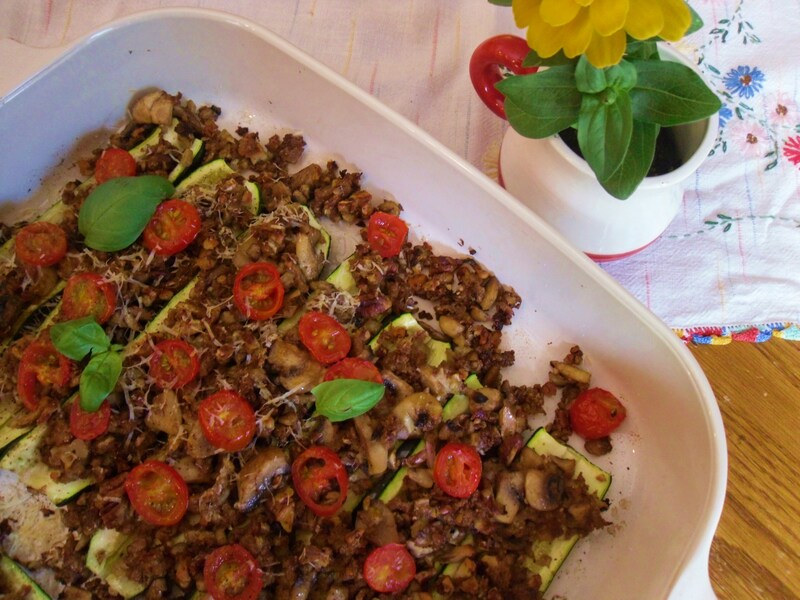 In the meantime, heat oil and butter together in a skillet, and add the chopped zucchini and mushrooms and garlic. 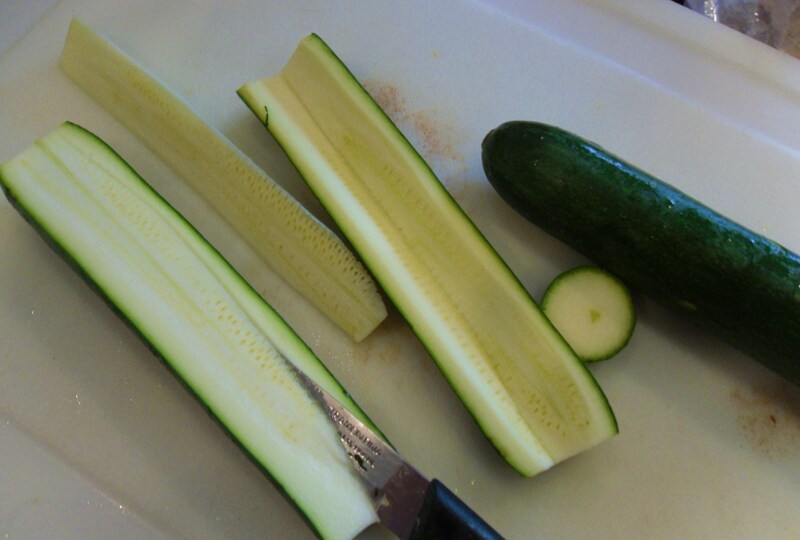 I scooped out zucchini by simply cutting a “v” shaped piece out of the center. 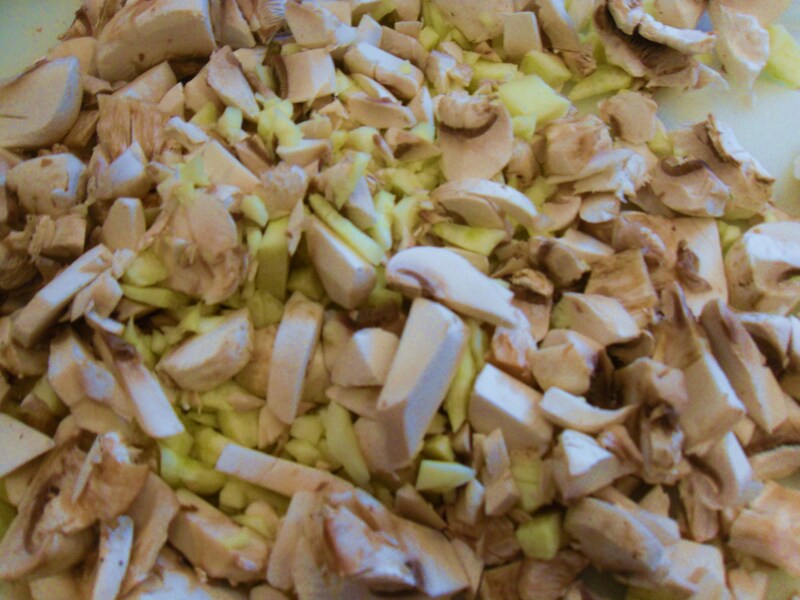 Stir and cover, cooking over medium heat for about 5 minutes, so that juices accumulate and don’t evaporate. When vegies are soft and translucent and “juicy,” toss in bread crumbs, 1/4 c. Parm cheese, pecans, 3/4 t. salt and 1/2 t. pepper. Stir. Turn off heat. Stuffing should be moist. (If dry, add a little more butter, oil and/or water.) 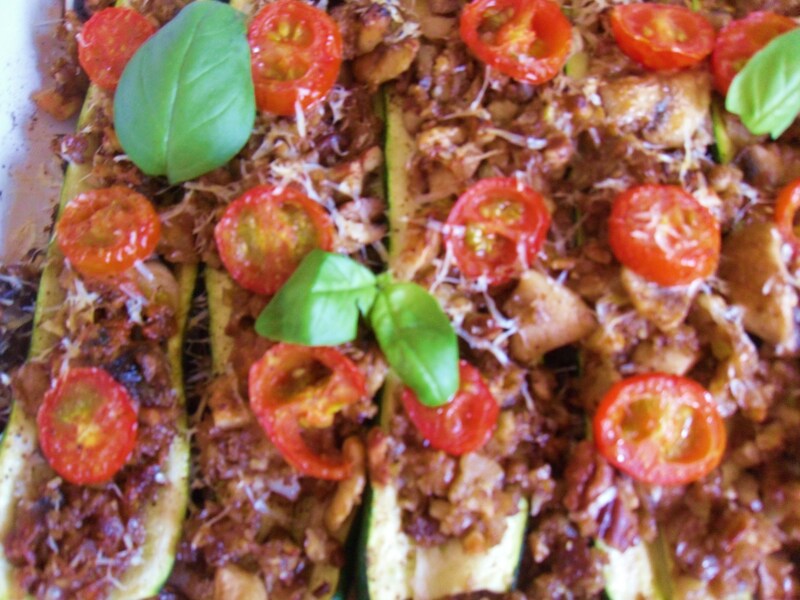 Fill the “nuked” zucchini with stuffing, decorate with sliced tomatoes, cover pan with foil and bake for 15 minutes. Remove from oven and sprinkle with remaining 1/4 c. Parm, and put back in under broiler, watching carefully until Parmesan starts to melt and tomatoes start to brown just a little. Garnish with fresh basil or oregano leaves. Delicious served alone as a vegetarian meal or as a side dish for any occasion. Variation: Try adding cooked crumbled sausage for omnivores in your family to make a complete meal-in-one.